Renowned for its high level attendance, thought-leading content and unrivalled networking opportunities, this Summit attracts more top water leaders and business executives than any other water event and is vital in shaping the movements of the water industry each year. 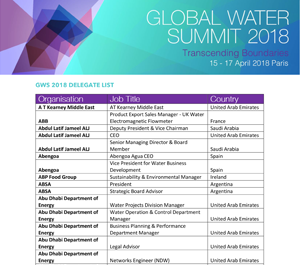 Over the last 10 years, more and more senior executives working in water have realised that attending the Global Water Summit is crucial if they are serious about growing their businesses, understanding how core markets are developing, keeping up with the competition and forging new business contacts. Business meetings are at the heart of this industry-renowned event. Every year, over 600 top executives – including water business leaders, industrial water users, utility managers, leading water technology providers and major investors – come together to determine water’s key role in sustainable economic growth and to meet with potential partners, suppliers and clients. Registered delegates enjoy over five hours of dedicated one-to-one meeting time, and booking meetings is easy via. the Global Water Summit App. Early booking is essential to guarantee you meet the people you need to meet. If you only attend one event this year, make it The Global Water Summit. The Global Water Summit is hosted by Global Water Intelligence, with the support of the Global Water Leaders Group and the Leading Utilities of the World Network. Global Water Intelligence is a market leading publisher with a global and financial focus. 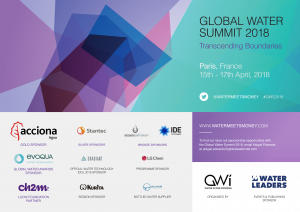 Founded in 2002, GWI has built an unrivalled network of high-level industry contacts, allowing us to deliver hard to reach and influential speakers and attendees from the industrial and municipal sectors as well as C-Suite executives from the industry’s leading players.